Triple threat! 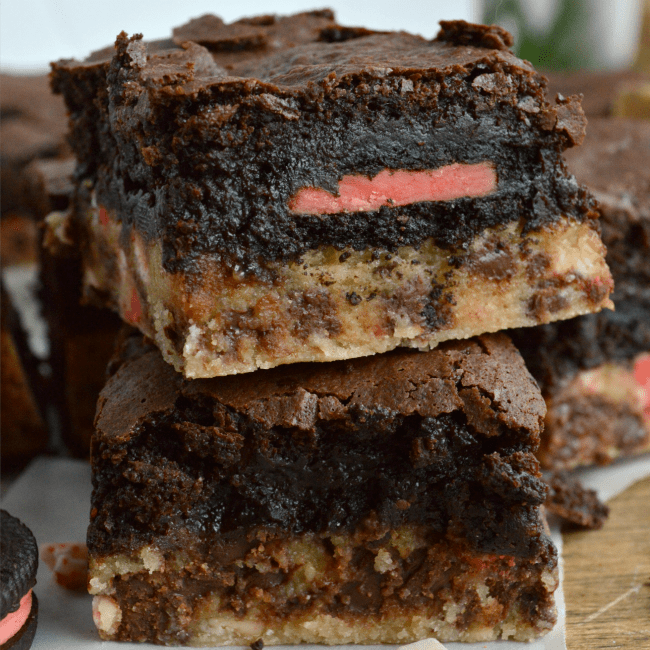 Slutty Peppermint Oreo Brownies are made with 3 layers of chocolate peppermint goodness — the perfect treats to celebrate the season. Chocolate chip cookie dough studded with crushed Andes mints, under a layer of Peppermint Oreo Cookies, and topped with my favorite quick from-scratch brownie batter! Make them happen. 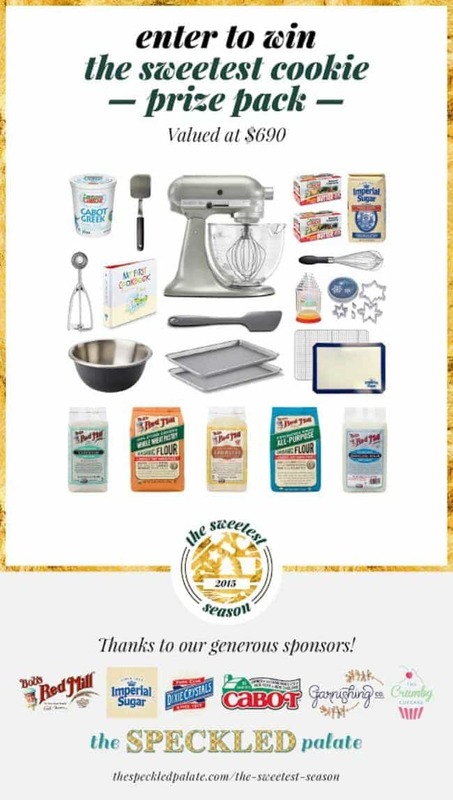 I received free product from Imperial Sugar, Dixie Crystals and Bob’s Red Mill as part of The Sweetest Season Cookie Exchange. As always, all opinions and recipe are my own. Thanks for supporting the brands that support Sugar Dish Me! Someone please take these brownies away from me before I hurt myself. GEEZ. You will probably remember the Slutty S’mores Oreo Brownies from this past summer. I cannot stop myself from buying all the specialty seasonal Oreo cookies. Even the lemon and pumpkin spice. But if we are keeping it real, my main favorites are (and always will be) peanut butter and PEPPERMINT. This time of year I crave all the peppermint things. And I had this whole other peppermint cookie recipe thing happening for today’s Sweetest Season Giveaway. BUT THEN I remembered that if you don’t go buy all the Peppermint Oreo Cookies RIGHT NOW, they will cease to exist until next year. So GO. Get them. 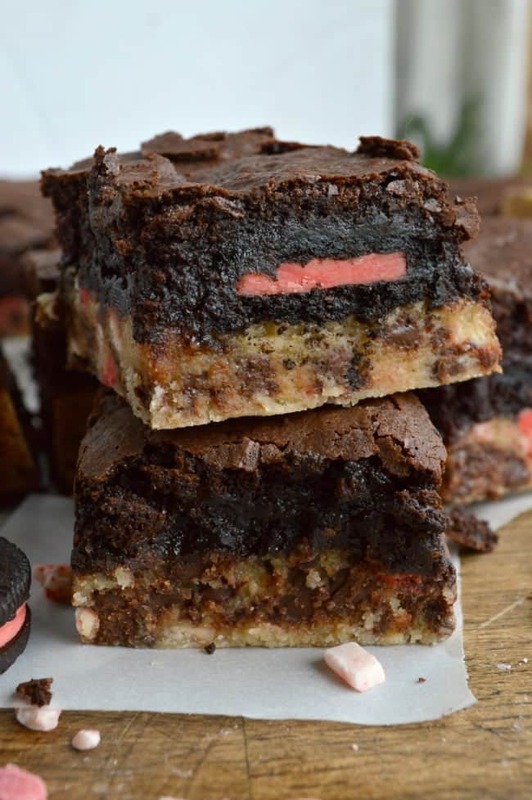 And make these Slutty Peppermint Oreo Brownies. This recipe is straight forward and basic. 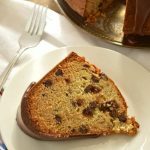 You can cut some corners and use refrigerated cookie dough, but! 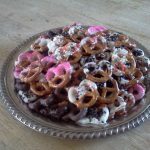 You will need to let it soften a little so you can mix in the peppermint extract as well as the crushed peppermint Andes pieces. I used my Chewy Salted Chocolate Chip Cookie Recipe and did some switching with the extracts. Add a layer of the peppermint Oreos and top it with my Best Basic Brownie Batter. Again, you CAN use a mix, but in my tests a mix actually yielded too much batter. The Best Basic Brownie Batter is JUST the perfect amount. Printable recipe follows! Note that with the Chewy Salted Chocolate Chip Cookie Dough, the full recipe is a little too much for the pan. I just set about 6 tablespoon sized cookies aside and bake them. You can’t go wrong. Giveaway info is after the recipe. There’s a mixer. Don’t miss it! Line a 9 X 9 square baking pan with foil or parchment paper. Generously butter the paper. Preheat the oven to 325F. Follow the preparation instructions for the Chewy Salted Chocolate Chip Cookie Dough, replacing the 1 Tablespoon of vanilla with 1 teaspoon peppermint extract + 1 teaspoon vanilla extract. Stir in the Andes Crushed Peppermint Chips with the chocolate chips. Press the cookie dough into the prepared pan. Prepare the brownie batter and pour it over the top. COOL COMPLETELY. Lift the foil or parchment from the pan, peel away from the edges, and slice with a good sharp knife. For pretty layered slices you might want to rinse the knife in hot water between cuts. I cannot handle how INCREDIBLE these brownies look. 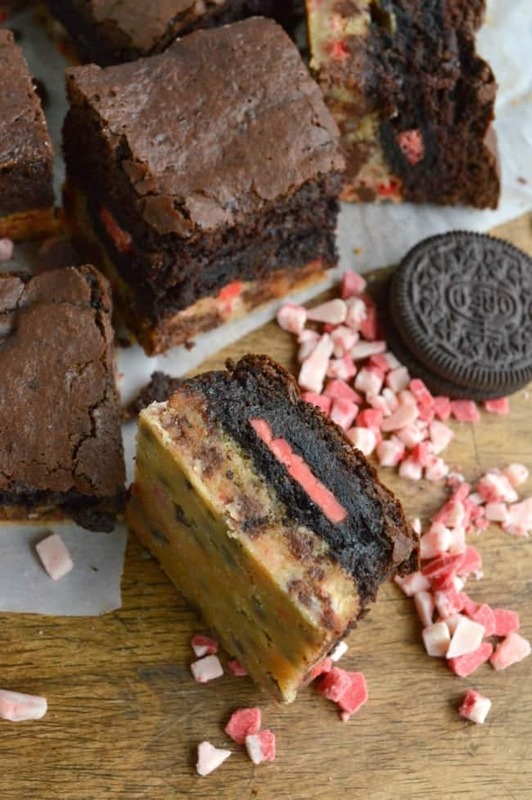 I meaaaaaaaaaaan… I didn’t realize Peppermint Oreos were a thing until this very moment, and combining them with cookie dough AND brownie batter sounds heavenly. And like the perfect thing for holiday cookies. Thanks so much for participating in The Sweetest Season! I’m adding these beauts to my list to be made during the holidays for sure! 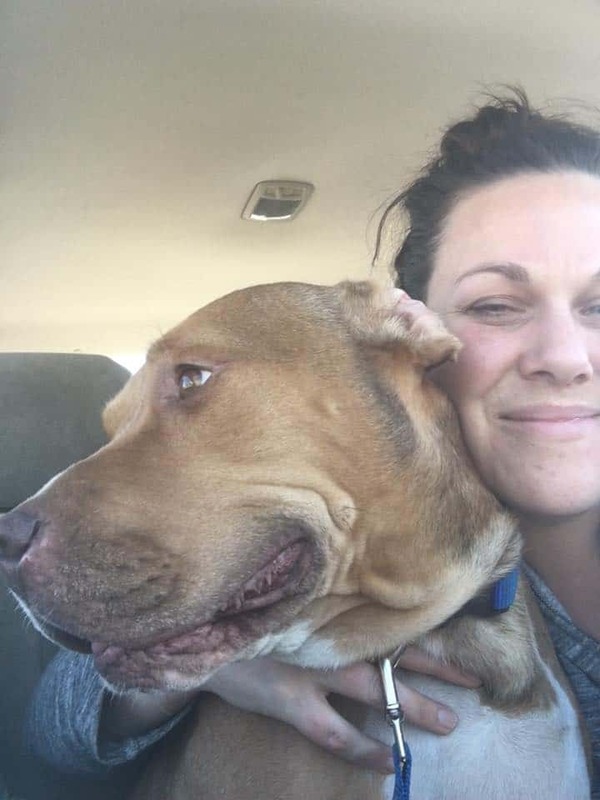 Thank you for organizing Erin! 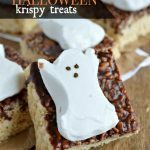 These look so over-the-top delicious! 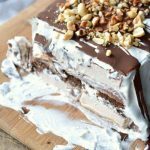 Brownies are probably one of my favorite types of desserts, and I love finding ways to dress them up. This is perfect for the holidays! Thanks Jenna!! These brownies are dangerous — and so easy! Hope you’ll try them! Oh my goodness, Heather! I crave peppermint now, too, and I’m sure I wouldn’t be able to stop eating these!! !